Alkasir is a free, open source website censorship circumvention tool, available for Linux, Windows and Mac. Android and iOS versions are "main objectives for 2016". For now it only works with Google Chrome. Besides allowing users to access censored websites, the application also keeps you informed about URLs that are still blocked and those which have been unblocked. Alkasir was launched in 2009 as a Windows-only closed source application however, with version 2.0, released in 2016, the application became free, open source software, and it gained support for Linux and Mac. It's important to mention from the start that Alkasir was created to bypass restrictions imposed by ISPs, "to allow users to access information about their countries and regions that are concealed by the states mainly because of political reasons. An example would be news websites that cover protests, expose corruption, promote open online discussions and debates on political, social and cultural issues, etc.". Its goal is not to unblock websites / services that exclude certain countries on purpose, like Pandora, Netflix, Spotify and so on, and it will not work with such websites. Its developers can't afford to support bandwidth-hungry websites and keep the service free. Note that while I like to test everything I post on WebUpd8, I couldn't test Alkasir because my ISP doesn't censor / block any websites. I decided to write an article about Alkasir because Lantern, a somewhat similar tool which I covered on WebUpd8 a while back, which was initially free to use, requires a paid subscription for unlimited usage for some time. Alkasir is available for Linux, Windows and Mac. The GUI (tray / AppIndicator) is available on Mac and Linux for 64bit only. For Linux 32bit (without a GUI) there are separate instructions for how to setup Alkasir. Setting up Alkasir (with a GUI) is fairly easy. Download Alkasir (in case the website is blocked by your ISP, here's a direct link to its GitHub download page - you'll need the "-gui" binary), extract it and simply double click the "alkasir" executable to run it. 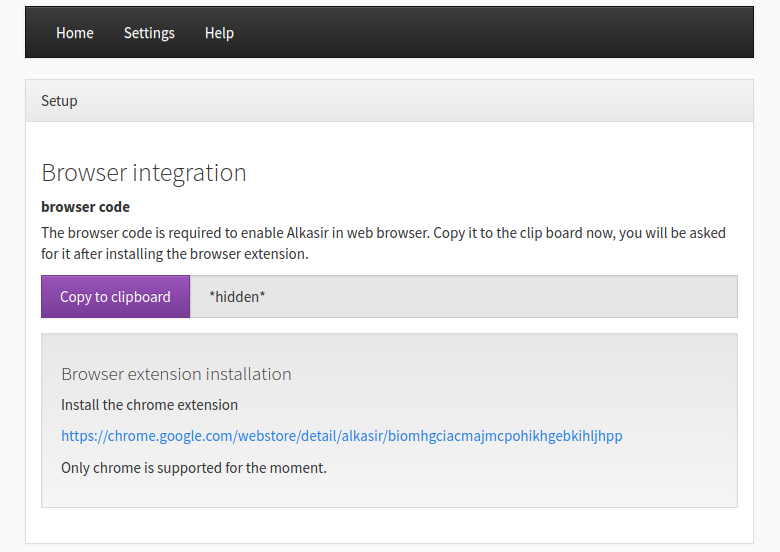 You'll also need to install the Alkasir Chrome extension. Next, from the Alkasir tray / AppIndicator menu, select "Open in browser". This will open the Alkasir web UI in your default browser. For the first step, you'll simply have to select the language and location. The language/location settings as well as the browser integration code can be accessed later, from the Alkasir settings, which can be accessed both via the Chrome extension or by selecting "Open in web browser" from the Alkasir tray / AppIndicator menu. If you're running a 32bit Linux distribution, there's no GUI binary available, but you can use the Alkasir Client binary, which is available for 32bit. To set up the Alkasir Client (without a GUI), firstly install the Chrome extension, then download the 32bit alkasir-client binary from GitHub, extract it and run it. The code you're looking for should be on line 6 ("ClientAuthKey") - copy this code, then right click the Alkasir Chrome extension, select "Options" and under "browser code", paste this key and right after it, add "::8899" (without the quotes). Now you should be able to complete the Alkasir setup process by clicking on the Chrome extension icon and following the instructions.